The first episode of the sixth and final season of Girls, and my oh my haven’t Hannah and co come a long way? What will happen to her and Jessa’s friendship? Is Marnie still the Worst Person Alive? Shoshanna, what’s your hair doing? All joking aside, season 5 of Girls was one of the strongest, so here’s hoping it goes out with a bang. Catch up with Adele’s tearful speeches, Beyonce’s magic performance and.. er… Neil Diamond’s carpool karaoke (with bonus Blue Ivy). It’s a Valentine’s Special and there are some good sounding dates in store. A glam girl and a nerd, an unlucky-in-love comedian, and a single mam looking for love. 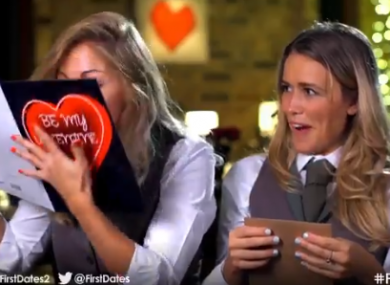 Is there anything cosier than First Dates? It may not look like much here but Westmeath woman Kelly was determined to get the utility room of her dreams, no matter what Dermot thought. Freaks and Geeks (Netflix) We recently rewatched the whole thing cos it’s on Netflix. It’s still great. Email “What to watch on TV tonight: Monday ”. Feedback on “What to watch on TV tonight: Monday ”.